SALEM, Ohio — Farmers who rely on immigrant labor are hoping President Donald Trump will soften his tone and understand its value across the agricultural sector. A study by Texas A&M University found that 51 percent of all U.S. dairy farm laborers are foreign-born workers, and, according to the USDA, almost half of all farm workers are Hispanic. During the presidential campaign, farmers were some of Trump’s strongest supporters. Now, some of those same rural Americans are hoping the president will see the importance of foreign labor, and find a solution that doesn’t leave farmers empty-handed. Christian Herr, executive vice president of PennAg Industries Association, said a few Pennsylvania farmers have already lost workers during recent raids by the U.S. Immigration and Customs Enforcement — including a raid in Lancaster County, where about 60 workers were deported. “The raids have been sporadic, but it certainly has the agribusiness and farm community very concerned,” Herr said. The farms that lose their workforce must adjust with little to no warning, causing disruptions in planting, harvesting and day-to-day operations. Herr said some of the state’s Amish farmers also employ immigrants, and that even when a farm loses a handful of employees, it can be devastating. “It throws off the entire farm economy, as far as I’m concerned,” he said. At the Andreas dairy farm near Sugarcreek, Ohio, Matt Andreas has been reviewing his worker records and making sure everything is filed and up to date. He hasn’t lost any workers, and doesn’t expect to, but he wants to make sure everything is accurate. He said some of his workers were a little nervous after the election, but he’s been trying to reassure them. He employs about 12 Hispanic workers with citizenship documents, or about half of his workforce. During the campaign, and during his first few months as president, Trump vowed to build a wall between the U.S. and Mexico and increase deportations. He also characterized some migrant workers as violent criminals. While there have been documented cases of violent crime coming from immigrants, farmers say their workers are committed to working. “That’s (criminals) a small, small, tiny percentage,” Andreas said, adding that his migrant workers are often willing to do work that American-born workers are not. Another challenge is the H-2A Temporary Agricultural Worker program, which allows U.S. employers to temporarily bring foreign workers to the country for employment, when not enough U.S. employees are available. The H-2A program has proven valuable to the produce industry, because of the seasonal nature of growing and harvesting produce. 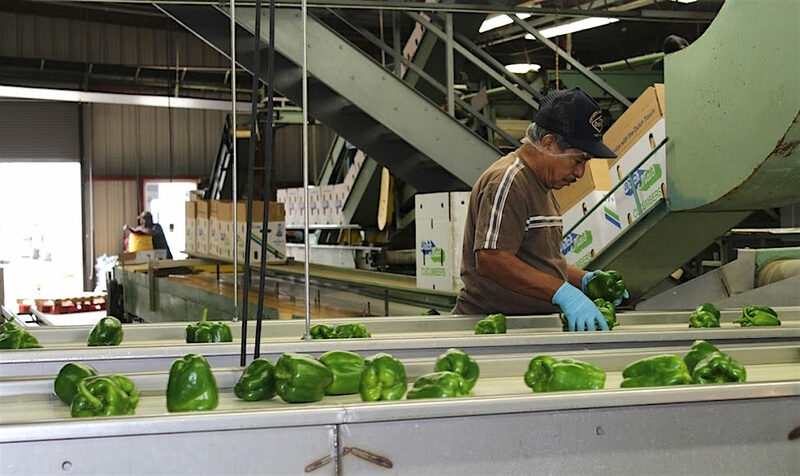 Most H-2A agreements allow growers to keep workers for up to 10 months. But growers have long said that the H-2A program it is inefficient and sometimes unreliable. Tom Witten, of the Witten Farm Market in Washington County, Ohio, said he relies on H-2A workers, who come legally and stay for six months. He said the program is seeing increased demand by growers, who cannot find enough local labor. He said improvements are needed, but he’s also thankful the program exists. Some farms have had difficulty getting workers on time through the H-2A program, and difficulty completing the paperwork. Jack Irvin, senior director of state and national policy with Ohio Farm Bureau, said H-2A has become inefficient and difficult for growers. “I think we (Farm Bureau) have a lot of concern with how the current programs work,” he said. Irvin said Farm Bureau is not necessarily backing any specific immigration policy at this point, but is trying to convey the message to the new administration that immigrant labor is important. Unlike seasonal produce growers, dairy farmers usually have a year-round need for labor, and therefore need a legal, year-round workforce. President Trump issued an executive order outlining his plan to crack down on illegal immigrants, just five days into office, on Jan. 25. His plan included building a wall along the southern border of the U.S., increased detainments of lawbreakers, and removing more illegal immigrants. But farm groups are still optimistic the president will understand their need for a legal workforce. In late April, United Fresh Produce Association member and former board chairman Maureen Torrey participated in a roundtable discussion with Trump and Agriculture Secretary Sonny Perdue. Torrey, of Elba, New York, said the president seemed to understand the need for law-abiding, migrant labor. “He (Trump) said that he understands how important it is for farmers to be viable in the marketplace and it was encouraging to hear him tell Secretary Perdue that, with respect to immigration enforcement, workers who are here and have not caused any problems, but have been productive workers, should not have anything to fear,” Torrey said in a released statement. She said Trump also acknowledged that the current H-2A program is broken. “It was also good to hear him say that there needs to be a year-round solution to agriculture’s labor needs and to hear him talk about the need for a skilled ag worker program,” she said. In late April, Trump signed an executive order that creates an inter-agency task force, known as the Task Force on Agriculture and Rural Prosperity. Its members will examine issues affecting the quality of life in rural America, including labor. United Fresh said the initiative has a lot of potential for the produce industry, and plans to work closely with task force members.